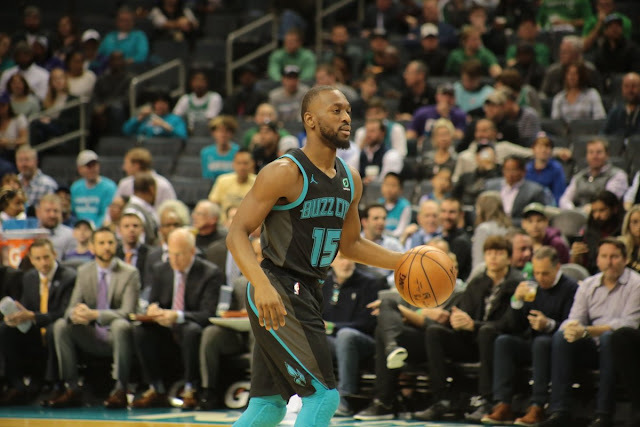 The Boston Celtics badly needed something to break their way after weeks of rough starts, and a three-pointer out the gate by the Charlotte Hornets' Kemba Walker certainly wasn't an auspicious start. The Cs kept it close early, however, with a balanced attack, perhaps driven by the move of Gordon Hayward to the bench; shots were falling inside and out, including for Hayward when he checked in with roughly seven left to play. Boston tied the game up at 13 soon after on a Mook Morris make, and while Kemba and company threatened to retake the lead, Kyrie kept the game close as the first frame wound down until Walker, joined by Miles Bridges, started to get some separation with back-to-back treys. A trey by Marcus Smart of all people, and a tip-in by Daniel Theis off a miss by Terry Rozier prevented one of the Celts' signature early holes from materializing, though, putting Boston down 24-29 at the start of the second quarter. That frame began with a three by Willy Hernangomez, and another by Dwayne Bacon, Charlotte's bench suddenly finding its shooting chops against Boston's perimeter defense, threatening another run until Smart's deep shooting and another near-bucket make from Theis stopped the bleeding. Good defense and Terry actually looking a little Scary with a three of his own cut the lead to 37-35 Hornets at the 8:30 mark, with both teams trading leads back and forth on the next several plays. Boston flirted with building a cushion, but Kemba and Marvin Williams kept the contest close. Jayson Tatum got hot in the half's final minutes, but so did Jeremy Lamb, the latter erasing the gains made by the former. Kyrie managed to hit a jumper to close out the second quarter, putting the Celtics up 56-54 at the halfway point. Nick Batum hit a three to open the third quarter, but Jaylen answered back with a layup on the next play. Irving stole back the lead, and another Smart trey (I could get used to this) gave the Cs their first cushion of the half, expanded with a pair of near-basket makes by Al Horford and Brown both. Charlotte kept chipping away at that lead, only to see Al and Jaylen keep Boston in front, 74-68 with about six minutes left in the third. The Hornets kept fighting, cutting the lead and eventually retaking it with a three from Hernangomez just under the three-minute mark of the third frame. Yet again, the teams would trade leads on successive plays, but Irving began to cook, pushing the lead back up to five to finish the penultimate quarter up 87-84. Boston opened the final frame off an oop from Terry to Theis, followed quickly by an Irving layup, but Kemba and Willy kept the Celts from running away with the game, and Tony Parker retook the lead 99-98 with just under seven minutes to go. Cardiac Kemba continued to go off, pushing the lead to 106-102 with just over 4:30 left to play, and Kyrie tried to go mano-a-mano, nearly retaking the lead at the three minute mark, but back-to-back buckets by Parker, threatening to ice the game until Tatum hit a three on a very broken play with less than a minute left. Walker continued his dominance by responding out of the timeout with a deep three of his own, and while Irving managed to get to the line, missing one, the Celtics couldn't find a way to stop the former UConn standout or the Hornets, sending Boston's tailspin into worrisome depths.